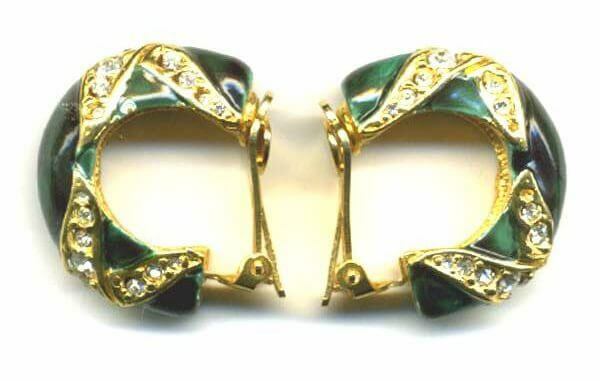 1960’s KENNETH JAY LANE ENAMEL HOOP EARRINGS – Recently I bought a collection of lovely jewelry from the 1950’s, 60’s and 70’s that had belonged to a very stylish woman. She was the accessories editor for Glamour and Seventeen and later fashion director. Many of the pieces were gifts to her personally from the designers. 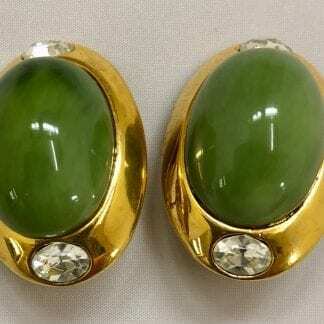 Here’s a pair of classic “Kennys”, with a rhinestone “X” motif, and green enamel over gold plated metal. 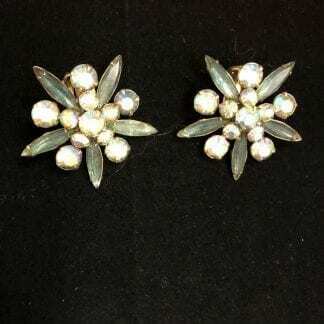 The earrings (clips, not pierced) measure 1 1/8″ long x 3/8″ wide. Each one is signed K.J.L. on an oval plaque and they are in good condition, with a couple of small chips and some wear to the enamel.